The Transportation Security Administration (TSA) screened a record 42 million-plus passengers during the hectic holiday travel season. The agency also announced it screened more than 30.6 million checked bags over the 19-day period from December 15 through January 2. To put that in perspective, TSA screens roughly 2.1 million passengers and crew on an average day. The Friday before Christmas was the busiest day for screening, with more than 2.5 million passengers and crew members passing through security checkpoints nationwide, making it the 11th busiest day in TSA's history. Despite the increased volume, 97 percent of holiday air travelers waited less than 20 minutes to get through their checkpoint. Meanwhile, more than 95 percent of TSA PreCheck passengers waited fewer than five minutes. "We saw a record number of passengers during both the Thanksgiving and Christmas travel periods," TSA Administrator David Pekoske said in a statement. "With enhanced security measures in place and the bustle of holiday travelers, our TSA officers excelled. They operated efficiently while maintaining a keen focus on security effectiveness, which was an enormous task, and I am very proud of them all." "The combination of increased passenger volume with a persistent terror threat means that TSA must continue to invest in its screening workforce, strengthen its close partnerships with the airline industry and deploy state-of-the-art technology," Pekoske added. With air travel on an upward trajectory, it should come as little surprise that nine of the top 15 busiest days on record in the past 16 years have all occurred since May 2017. 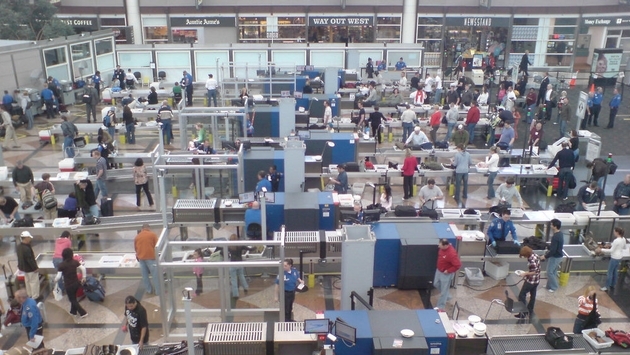 However, the busiest TSA screening day remains November 28, 2004, the Sunday after Thanksgiving. More than 2.7 million passengers were screened that day. While TSA was able to conquer another busy holiday travel season, 2017 was not without its speed bumps for the agency. Officials failed to detect an alarming percentage of test weapons smuggled through checkpoints by undercover inspectors and routinely struggled to recognize Washington, D.C. driver's licenses. However, TSA officers were successful in seizing some bizarre items last year.